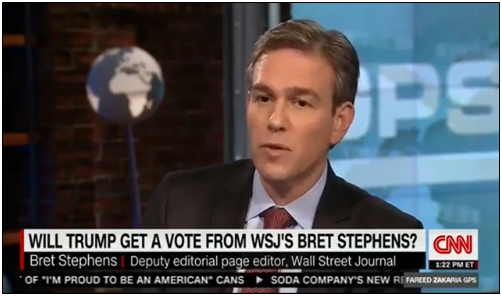 Bret Stephens, deputy editorial page editor of the Wall Street Journal was recently interviewed on CNN regarding Donald Trump. In that interview Stephens expressed a desire that Donald Trump be “the biggest loser in presidential history.” He went on to state that he wouldn’t vote for Trump so that “Republican voters will forever learn their lesson that they cannot nominate a man so manifestly unqualified to be president in any way, shape or form.” He then opined that Republicans need to learn the lessons of McGovern in 1972, referring to McGovern’s loss of forty-nine states in the presidential election that year. The breathtaking arrogance of Mr. Stephens is typical of the so-called #NeverTrump crowd. He apparently believes that Americans love to be lectured by their intellectual and social betters. This is his idea of persuasion. Forget the fact that Mr. Trump has received more primary votes than any Republican in history and listen to Mr. Stephens. After all he has been to all the best schools, knows all the best people and goes to all the best parties plus he has won some journalism prizes given to him by other journalists of his ilk. Why would we listen to the great unwashed stupid voters rather than him? You can almost feel his pain. One is reminded of the Marie Antoinette quote, “Let them eat cake.” The only difference being we do not know for sure that she ever said that but we have it on tape that Stephens said what he said. Mr. Trump is running on three major issues: (1.) enforce current immigration law; (2.) negotiate better trade deals; and (3.) install an America first foreign policy. Mr. Trump’s opponents cannot argue with him on these issues on the merits since it appears the voters agree with him. Because of that they resort to self-righteous name calling. Fortunately as “fake but accurate” Dan Rather and Lyin’ Brian Williams found out the media landscape has changed. The public no longer must rely on their reports. In fact the public no longer believes them. Their prejudices are so obvious they have become ineffective. According to a Gallup poll, trust in the media is at a historic low. Here is an example as to why that is. So if Mr. Trump wins, Brett Stephens and all his fancy pants cohorts lose. And that is a good thing. Don Todd is Director of Research at Americans for Limited Government.